Jobs report summary for the Finance and Accounting industry. Based on the BLS report with June 2014 data. 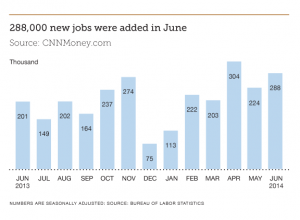 Just recently released, The Bureau of Labor Statistics reports 288,000 jobs were added in June, a substantial increase from May’s reported numbers and a surprise from economists. With June’s newly added jobs, the American workforce has grown by at least 200,000 jobs per month for the past five months. While this seems to be a positive gain for the workforce, the labor participation rate still sits at 62.8%, a discouraging number to economists and workers alike. The overall workforce continues to grow, yet the economy still remains stagnant. Economists are predicting an upswing in the economy for the second half of 2014, but we cannot expect jobs to continuously grow month over month without this predicted rise. With 67,000 added jobs in June, the Professional and Business Services industry was one of the largest sectors for growth once again. Not only was it one of the largest sectors of growth for the month, but continues to reign supreme for the entire year. The Financial activities sector added 17,000 jobs in June, which is an immense increase from the previous months. With the economy still acting sluggish, it comes as a bit of a surprise that financial activities jobs rapidly increased in the month of June. With the second half of 2014 expecting to flourish according to economists, we can only suspect the Financial Activities sector to continue growth. For the month of June, wages for the Financial Activities sector increased 20 cents from May. While the increase in wages is a substantial gain, the overall average hourly earnings of the American workforce are up just 2% over the past 12 months. This is discouraging for the American workforce as well as economists, and may be a direct reflection of an economy that truly does not match a growing workforce.